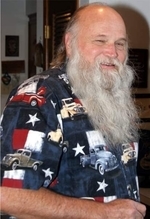 Gary Michael McCarley, 67, passed away on Wednesday, April 3, 2019 at his home in New Caney, Texas. He was born on January 31, 1952 in Bremond, Texas and graduated from Bremond High School in 1970. Gary proudly served in the United States Air Force from 1972 to 1980 where he was a computer programming specialist and a jet aircraft specialist. He married the love of his life Becky S. Stout on September 19, 1992. After his retirement Gary enjoyed reading, wood working, making hot pads, cooking, baking and riding motorcycles and especially time with family and friends. Gary is preceded in death by his grandparents, Floyd and Lucille Caskey; aunts, Bobbie Sue Caskey and Floycille Smith. He is survived by his loving wife of 26 years, Becky S. McCarley; mother, Ladelle Dukes; sister, Ruth Tipton and husband Mike; brother, Mark Dukes and wife Deb; daughters, Michelle Leal, Patricia Crayton and husband David; grandchildren, Alex, Matthew, Malana, Steven and Myah; aunts and uncles, Sam and Geneva Towns, Earnest and Janiese Caskey; numerous nieces and nephews and cousins; his constant companion, his fur baby “Puffer”. A visitation will be held from 5:00 p.m. to 8:00 p.m., Wednesday, April 10, 2019 at Rosewood Funeral Home Porter, Texas. Funeral services will be at 10:00 a.m., Thursday, April 11, 2019 at Rosewood Funeral Home Chapel in Porter, Texas. Graveside services will be at Morgan Cemetery, Spelendora, Texas.